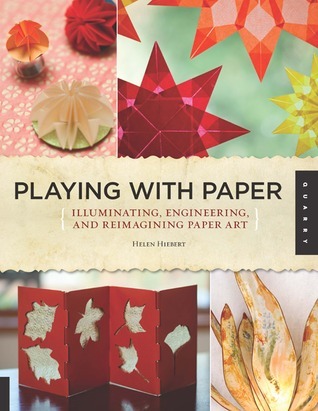 First up Helen Hiebert author of Playing with Paper: Illuminating, Engineering, and Reimagining Paper Art is at CODEX in Richmond, CA. She sent in this photo of her in her booth! Here's an attendee checking out Helen's work. Also, Quarry Books is hosting a Goodreads.com giveaway where winners will receive an autographed copy of Helen's book, Playing with Paper. Enter below for your chance to take home this amazing book. Good luck! How to make your own marshmallows. 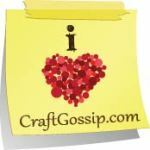 Not only can you learn how to decoupage, you can find many fun projects, books, decoupage paper, and much more. Cyndi's project for her granddaughter left everybody smiling. Get a chance to win some awesome lampwork beads on the Crafty Princess Diaries. Do you know how to lay out two unique invitation size notecard designs on a single 8 1/2 x 11 sheet of card stock? It's really quite easy and can be done in any graphic or greeting card program. Cherie uses Proverbs as inspiration for her artwork this week. June's giving away some art! Celebrating back to school with a BIG bulking dummies book giveaway! As the title of today's post says, we have 50 bulking dummies to give away to celebrate the back-to-school season! We'll send one of these cool blank books to 50 people who leave a comment in today's post by Thursday, Midnight EST, August 18, 2011. Winners will be randomly chosen. Let me explain what bulking dummies are in case you don't know. When a book is in development, a sample is made with the paper in the size, finish type (matte or shiny) and hard or soft cover before it's printed so the designers can get a feel for the book. They are all different and could, as you can see, contain writing or be an actual printed cover with the inside blank. These will make cool journals or virtually anything you want! We do try to be "green" here at Craftside. How would you describe your style/taste and/or your style likes/dislikes? Pick one or more or make up your own! Jason Thompson is the founder and president of Rag & Bone Bindery, and author of Making Journals By Hand (Rockport Publishing 2001). He is highly regarded as a book designer with integrity who creates unique handbound books and other fine bindings, as well as a popular blogger who writes about bookbinding, book arts, artist books, and paper craft. To see more inside peeks into Playing with Books pop on over to this post at Jason's blog. I have a fun spin on this recycled book page ornament from Playing with Books: Upcycling, Deconstructing, and Reimagining the Book to share with you before Easter. I pulled out my McGill egg punch and an old book and started cutting egg shapes. Instead of sewing the pages together as the project from Playing with Books: Upcycling, Deconstructing, and Reimagining the Book instructs, I simply used a glue stick to make my three-dimensional paper egg ornament. I put a loop of gold cord inside the new center spine before I glued the last two egg sides together. I think it will make a fun new addition to my egg ornament collection. I think an old kids' Easter picture book might be cool to try this project with! If you like cutting up books to make new things, check out Playing with Books: Upcycling, Deconstructing, and Reimagining the Book which is packed full of great tutorials and ideas. The content encompasses a wide range of techniques and step-by-step projects that deconstruct and rebuild books and their parts into unique, upcycled objects. The book combines in equal measure bookbinding, woodworking, paper crafting, origami, and textile and decorative arts techniques, along with a healthy dose of experimentation and fun. The beautiful high-end presentation and stunning photography make this book a delightful, must-have volume for any book-loving artist or art-loving book collector. To see more inside peeks into Playing with Books, pop on over to this post at Jason's blog. How to make a recycled postcard stitched book by Jeannine Stein, plus kit giveaways! Jeannine Stein, author of Re-Bound and Adventures In Bookbinding, has put together super cute kits for making this recycled postcard book. The following are the directions on how to make a recycled postcard accordion fold book so you can make your own. But if you buy either of her books on Qbookshop, Re-Bound or Adventures In Bookbinding (which you can pre-order), then you get a free kit! Just write "POSTCARD BOOK GIVEAWAY" in the "How Did You Hear About Us?" section of the Qbookshop order form, and we'll send you your kit. The fine print is we have 15 to give away - the first 15 buyers or pre-orders get them! Click on the images to enlarge and tread the postcard bookmaking tutorial. I can't wait for this book to be released! Each project in this book combines bookbinding with a specific craft such as quilting, jewelry making, or polymer clay, and offer levels of expertise: basic, novice, and expert. Illustrated step-by-step instructions and photographs demonstrate how to construct the cover pages, and a unique binding technique, easy enough for a beginner to master. Each project also features two other versions with the same binding geared to those with more or less experience. The novice version is for those who have no knowledge of the craft and want shortcuts, but love the look. For the quilter's book, for example, vintage quilt pieces become the covers so all that's needing in the binding. Or if you're interested in wool felting use an old sweater. This offers great opportunities for upcycling. The expert version is for those who have a great deal of knowledge and proficiency of a certain craft - the master art quilter, for example. For this version, an expert guest artist has created the cover and the author has created the binding. This offers yet another creative opportunity - the collaborative project. Since crafters often get involved with round-robins and other shared endeavors, this will show them yet another way to combine their skills. No other craft book offers the possibilities and challenges that Adventures in Bookbinding does. Readers will return to it again and again to find inspiration and ideas. Jeannine Stein has been making books for more than fifteen years, exploring bindings, mediums, and techniques. In addition to teaching book-binding, she is an award-winning journalist, and she has written extensively about paper crafts-artists' books, scrapbooking, rubber stamping, and letterpress. She is the author of Re-Bound: Creating Handmade Books with Recycled and Repurposed Materials, (Quarry Books, 2009). Re-Bound shows readers how to take every day materials from around the house, flea markets and thrift stores, and hardware and office supply stores, and turn them into fabulous books. Instead of saying, What can I make a book out of, readers will be thinking, What can't I make a book out of? In Re-Bound, a vintage souvenir wallet becomes a photo album. Last year's trendy sweater becomes a takealong journal. Even potato chip bags get a second life as a handy pocket notebook. This fun pursuit is economical as well as ecological. A variety of attractive, uncomplicated bindings, how-to instructions, and step-outs bring each project to life. Yes, you read the title right! Craftside has partnered up with Westcott to bring you 2 fabulous giveaway packages in this Craftside Holiday Goodness Giveaway ! You have 2 chances to win. To be entered to win this first prize package, including the book 365: A Daily Creativity Journal: Make Something Every Day and Change Your Life! and an amazing assortment of Westcott cutting implements that include all sorts of sizes and shapes of scissors, craft knives and multi purpose trimmers, leave a comment in today's post here at Craftside. Answer the question: What would you like to see us post more about here? And to be entered to win the second fabulous prize package that includes the book Playing with Books: Upcycling, Deconstructing, and Reimagining the Book and another amazing collection of Westcott cutting implements that include all sorts of sizes and shapes of scissors, craft knives and multi purpose trimmers, pop on over to the Westcott Facebook page and "LIKE" them. Leave a comment there and you are in the running! You have one week to be entered here and there, all comments must be in by midnight ET Wednesday December 15, 2010. You may enter once at each location. Open to US residents only; winners must provide a physical address (no PO Boxes). Be sure to keep coming back here because there will be lots more super-fabulous giveaways (and our usual fun inside peeks into new books) you will want to get yourself in the running for! And speaking of inside peeks, I can't let this post go by with our one! I thought this sewn paper ornament from the book Playing with Books: Upcycling, Deconstructing, and Reimagining the Book would be fitting for this holiday season. Click on the images from Playing with Books: Upcycling, Deconstructing, and Reimagining the Book to enlarge and read how to sew a recycled book ornament. The concept of Noah Scalin’s "365 method" is simple but inspired: Choose a theme or medium, then make something every day for a year. Noah made 365 skull-themed projects... now he invites you to choose your obsession and get creative! The book offers 365 project prompts to kick start your creativity, plus plenty of room for journaling, sketching, and jotting down ideas. Learn how to choose your subject and document your work, and see examples from other artists and crafters who took the 365 challenge. In addition, master new techniques to incorporate into your projects, including quilling, clay-making, paper pop-up engineering, and more. Share your progress with other 365-ers at www.MakeSomething365.com. With 365: A Daily Creativity Journal you’ll get charged up, get messy, and get inspired, and you’ll see how making something every day can change your creative process—and change your life forever! In 2007, artist Noah Scalin came up with an ingenious idea: he cut a skull out of orange paper and posted it on his blog with the note, “I’m making a skull image every day for a year.” His year-long art project became an award-winning internet sensation that resulted in the book Skulls, as well as landing him in the New York Times and on the Martha Stewart Show. He lives in Richmond, Virginia. Save 30% Off Everything at Qbookshop! gift books are 30% off, along with everything else at Qbookshop! And sometimes, the best gift is the one you give yourself. to receive 30% off all products in your order. Hurry, this offer ends midnight CT on Friday, December 31, 2010!